A few weeks ago, while waiting to begin my nocturnal hunt for the Great Plains giant tiger beetle (Amblycheila cylindriformis) in northwestern Oklahoma, I spent the daytime atop one of the red flat-topped mesas that meander through the area in nearby Gloss Mountain State Park. Although my trip was all about seeing this giant of a tiger beetle in the wild for the first time (I could hardly wait for dusk to begin my search), I found enough splendid insects of other types atop the mesa to occupy my interest until that time. One of these was the still-robust population of the Swift Tiger Beetle (Cylindera celeripes) that I discovered last summer and delighted in photographing yet again, while another was North America’s largest robber fly – Microstylum morosum! I had just finished photographing one of the tiger beetles near the edge of the mesa when I turned and saw one of these impressively large flies sitting calmly on the ground nearby. I first encountered this species last year in southwestern Missouri (a new state record! ), so there was no question about its identity. I also remembered how skittish they were and how difficult it was to get even the two mediocre photographs that I included in the resultant post. Expecting the same, I kept my eye on the ground-sitter while preparing the camera and approached it with extreme caution. To my surprise, it showed no sign of being alarmed or wanting to take flight. I crouched down low and marveled at its monstrous impressiveness as I took frame after ever closer frame – eventually zeroing in on the head and its stunningly magnificent emerald-green eyes. Satisfied that somewhere in the dozen and a half frames that I shot was at least one or two winners, I sat up and probed towards it with my finger to see how quickly it took flight. It just sat there tenaciously until my touch caused it to finally take wing. Winds were gusty atop the mesa, which may have accounted for its cooperativeness. Standing up, I noted a few scattered eastern redcedars (Juniperus virginiana) in the mixed-grass prairie at the highest point of the mesa. I recalled that robber flies are fond of “hilltopping” – a mating strategy whereby males fly to the highest point in their immediate landscape to defend a small territory or perch that provides a good vantage for spotting females and competing males (see Hilltopping by Eric Eaton at Bug Eric for a good discussion about this) – and my own experience with this species in Missouri and the way it tended to perch in the trees scattered across the upper part of the rocky, dolomite glade where I found them. I wandered up to the redcedars, and as soon as I came close enough to one of them I saw another individual take flight – looking like some super-sized mosquito with it’s long legs spread wide as it clumsily flew to another tree. As it turned out, I saw a number of individuals and mating pairs perching and flying among the trees on top of the mesa, each more spectacular than the previous. Until recently, Microstylum morosum was considered a Texas-endemic. However, Beckemeyer and Carlton (2000) documented this species to be much more broadly distributed in the southern Great Plains (from Texas up into Oklahoma and Kansas and west into New Mexico, Arizona, and Colorado), and Warriner (2004) recorded it shortly afterwards in Arkansas. Although the species apparently occurs throughout Oklahoma (Beckemeyer and Carlton recorded from 13 counties across the state), my observation of it in Major County does seem to represent a new county record for the species. There is another U.S. species in the genus, M. galactodes, and it has also been recorded from Oklahoma (the closest record is in nearby Woodward County). However, it is easily distinguished by its generally smaller size, milky white wing membranes, reddish-brown body, and head and thoracic dorsum evenly covered with whitish pruinescence, while M. morosum has the wings and body black to brown and thoracic pruinescence restricted to the lateral margins (Beckemeyer and Carlton 2000). I’m not sure I would have recognized that species for what it was had I seen it, but if it is anywhere near as impressive as M. morosum then I hope I have the fortune to find it someday as well. Landscape: Canon 50D w/ 17-85mm wide-angle lens (17mm), ISO 100, 1/100 sec, f/10, ambient light. Typical post-processing (levels, unsharp mask). Insects: Canon 50D w/ 100mm macro lens, ISO 100, 1/250 sec, f/10 (photo 1), f/18 (photo 2), Canon MT-24EX flash (1/4 ratio) w/ Sto-Fen diffusers. Typical post-processing (levels, minor cropping, unsharp mask). Beckemeyer, R. J. and R. E. Carlton. 2000. Distribution of Microstylum morosum and M. galactoides (Diptera: Asilidae): significant extensions to previously reported ranges. Entomological News 111(2):84–96. This entry was posted in Asilidae, Diptera and tagged entomology, flies, Great Plains, insects, landscapes, nature, Oklahoma, robber flies, science, taxonomy. Bookmark the permalink. Very nice shots. The proboscis seems to be much longer than those i see round here (Malaysia). 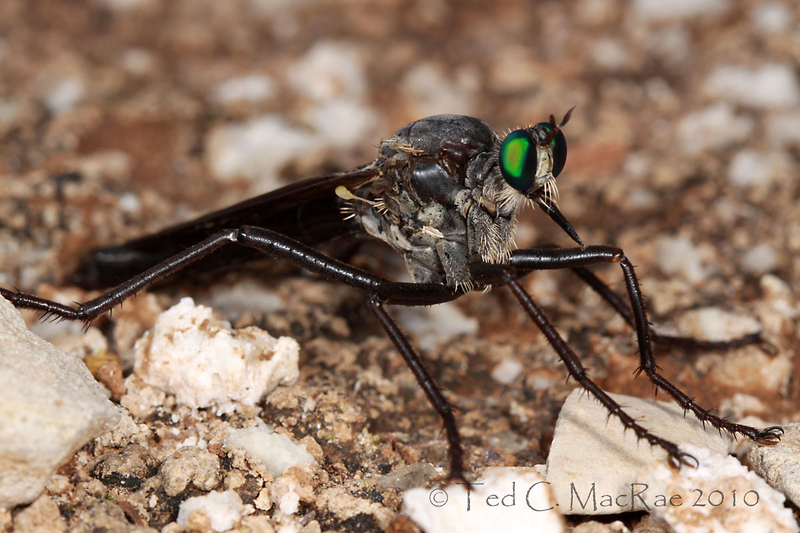 I have yet to come across a well behaved robber fly. Amazing eyes. So, how big is “monstrously big”? The species ranges from 35-50 mm in length – this one was probably near the upper part of that range. Hmm, it never even occurred to me to break out the 65mm for a 2-inch long insect! I’ll have to start thinking more like a photographer. As cooperative as it was, I’ll bet I could’ve gotten some quite close shots of the head. Nice shots, Ted. Insects this size are notoriously difficultly to light in the field. Thanks, Alex. I’m finding that out – I took several additional shots of the critters sitting in the junipers and just could not get the lighting right (the green eyes became washed out yellow). While I am happier with these photos than those I featured last year, I’m still not completely satisfied with them – the color of those eyes is simply dazzling in real life! Excellent story and exceptional photographs, Ted. You keep on raising the bar. 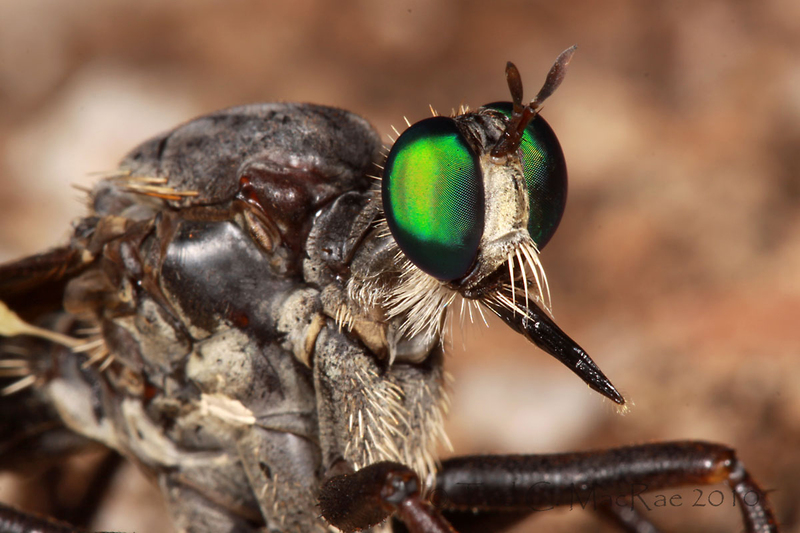 The robber fly close-up is just astounding! Thank you, Dave. The unusually cooperative robber deserves some of the credit – it sure makes it easier to get the shot you want when you don’t have to constantly chase down the subject. 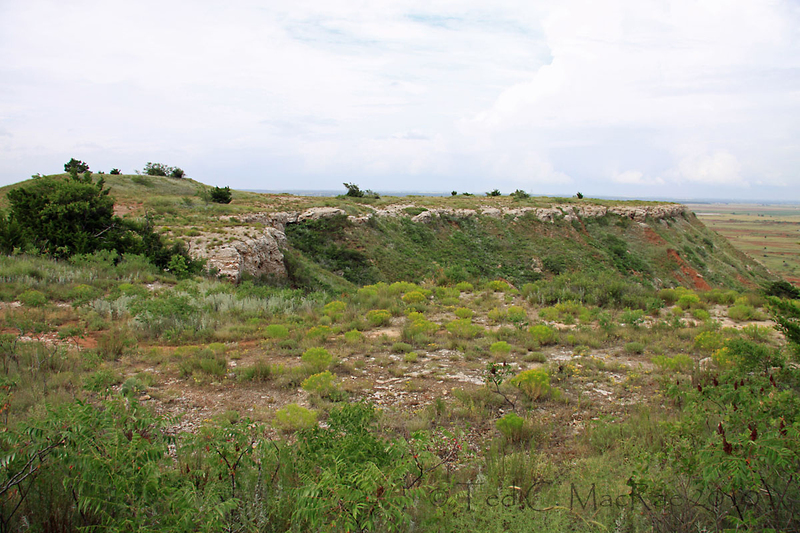 A treasure trove of giant robber flies perched a top a primeval mesa! Sounds worthy of Jules Verne and that beak looks like it could deliver quite a stab. I found that mesa last year quite by accident and have fallen in love with it – I’ve been there three times now and will probably go back again this fall (I’m still convinced that the stunning Cicindela pulchra will be found there). You should see them when they fly – not quite so zippy as other robbers, but more of a loping, wavering flight which, combined with their size, makes them almost look dangerous. What a sight! I am fully acquainted (and completely enamored) with the fantastic insect fauna of Texas – this guy is as dazzling as anything I’ve seen in your great state. Great stuff Ted. What’s the size of your green-eyed monster? I recently saw my first huge Robber – over an inch long – and had no idea they came in such sizable packages. Thanks, Ken. This one was near the upper size limit for the species – close to 2″ in length! Yours looks like a species of Promachus – although I’m no robber fly expert. …is there supposed to be another “s” in your blog post title? Dang! I’ll have to fix it – I’m too retentive to just leave it. Fantastic photos. I just recently encountered this large fellow for my first time. They are magnificent. I gave you a call-out and reference to your earlier post. Thanks, Troy. They are certainly impressive upon first encounter. Glad you found my earlier post when trying to ID yours. Fantastic shots, Ted! I’m always enamored of robber flies, and this is a beautiful specimen. The eyes just slay me. Glad you had such a cooperative individual. Wow, that must have been a high getting these closeups. Good show. Thanks, Steve – yes, quite exciting. I spent quite a bit of time last summer stalking these guys in Missouri and never could get closer than a couple feet or so. Just what I like to see, a fly! Great shots! Thanks, Morgan. I figured you’d like this one. I think this is really about the coolest fly I’ve ever seen! Ted, Can you provide specific locality info for your Missouri and Oklahoma records? I try to keep the map in my and Ralph Charlton’s 2000 paper updated. Prey info/pics would also be of interest, as Darren Pollock of Eastern New Mexico University is planning to do a paper on Microstylum prey.